Sophie Dartigalongue will play principal bassoon in the Vienna Philharmonic New Year’s Day Concert, televised around the world. It’s her first New Year’s concert and Vienna’s first time playing on TV with a woman principal. Sophie, 24, won the bassoon audition in May and was appointed principal bassoon in September. The fact that she has been given such a high – profile gig in her first season shows that maybe the times really are changing. I’m a little curious: Isn’t it normally the practice of the VPO that you have to be in the VSOO for three years before you’re invited to join the Philharmonic? In which case, is she even an official member at this point? No she’s not an official member (yet! ); she’s been appointed to the VSOO. She’s a wonderful player so much luck to her. Musicians in the VSOO who haven’t yet been tenured into the VPO perform with the VPO in an associate status. It helps keep the number of services for everyone manageable. I have no idea why she is playing, but it could be something banal like her co-principal colleague has some other engagement like a family event, an out of town concert, or whatever. A woman playing in the Vienna Philarmonic ! And a french one furthermore …. It’s the revolution in the very catholic and conservative Vienna ! Sorry, I don’t understand what the Catholic Faith has to do with a French female bassoon player. Also, Catholicism in Vienna has became everything but conservative. Card. Schönborn, archbishop of Vienna, is one of the main exponenents of progressivism within the Catholic Church. Catholicism used to be the religion of state in France and today is still more predominant than other religious affiliations. Also, the Catholic Church of France is sometimes called “eldest daughter of the [Catholic] Church”. This has nothing to do with the topic: a brillant French female principal bassoon player who is going to appear for the first time in the ranks of the Vienna Philharmonic at the New Year’s Concert. What does this have to do with religion and with Catholic Faith in particular? Religion has nothing to do with it. I was (in a glib sort of way) pointing out for “Debussyste” that Mrs Dartigalongue coming from a country with deep Catholic roots, may have lessened the shock in the “very Catholic” Vienna at her appearance….. Personally I’ve always been too busy listening to Mrs Dartigalongue’s playing than to give any thought to bassonists in the religious framework of Vienna. I agree with your approach: listen, and do not care too much about nationality, gender, religion, etc. This is the reason why I never liked the usual approach to the Vienna Philharmonic issue. For many years Mr. Osborne has been pointing out the gender/racial issue in this orchestra. But this is a false problem. In my opinion the VPO has a bigger issue: they’re an old-minded orchestra. They think they’re still in the 20ies-30ies, when they were the best orchestra in the world and they’ve been mantaining this approach: “we’re the VPO, we’re the best, what do you want more?”. The problem for them is that the average quality of orchestras has greatly improved. Today not only the BPO and the KCO, but also the BRSO, the Staatskapelle and the Gewandhausorchester are much better. And the reasons are not only the low female/male ratio, but most of all the lack of rehearsals, the lack of a chief conductor, a difficult relationship with the opera, a certain nepotism, a provincial mentality, wrong guest conductors, the too much touring around the world, a certain moody, elitist and business-like approach, etc. They must realize that the audience go to their concerts and spend lots of money not for their glorious history, but for beautiful and well performed music. In other words: the problem with the VPO is artistic and very deep and complex. Increasing the gender ratio is fine, but it’s not going to solve their problems completely. It may sound brutal, but it’s what I think as a huge fan of the VPO. Matteo’s perspective is very interesting. I think solving the gender/racial issues is playing a significant role in helping the VPO move forward. And in ways that are actually helping the orchestra to maintain its *musical* traditions. Mr. Osborn, in order to find solutions, one got to understand first what the problem is. I don’t think that is the case here. It is my impression that you describe a reality – or a legitimate view on it – from about 30 to 20 years ago, and apply that frozen old trauma (Celi’s conflict with your wife) to today’s world, not seeing the reality as it actually is now. And then all this “newspeak”. What does an “orchestra moving forward” actually mean? In what direction? With which objective? The only “racial” issue that needs to be solved here is this blog’s relentless mud throwing at the Vienna or other cultural lighthouses of Austria or Germany. Also it would be nice to see the same and non-hypocritical rigor applied to the much more obvious racial issues which orchestras like the NYPhil or the Israel Philharmonic expose. and @ Matteo: I can not at all confirm your statement from my many recent real concert encounters with VPO and the other mentioned continental European orchestras. The Vienna Phil actually seems to be doing something better as the others, since they are so indisputably, *the* best orchestra, regarding the very traits of orchestra culture that make the difference between a good orchestra and a collective of good individual players. Their level of “blind” understanding, collective style, breathing, phrasing, is in a league on its own. Their ability of 80 musicians playing refined and with flexibility like a small chamber group is not to be found in any of the other orchestras you mentioned. Not that they have it every time in every concert, or even every single routine duty in the pit, but their overall consistency is there, despite the efforts of many outsiders to discredit them based on non-musical criteria. Berlin Phil for instance, is an orchestra with incredible individual potential, but lacking the unifying force of a common musical and sonic approach. It took a while for the omnipresent Karajan impact to fade away, but that “account” is empty now. Their choice of K. Petrenko might hint at their awareness of the problem, because he is a musical choice. The title of this topic: “Watch that French bassoon”, is slightly misleading. One could gather from it that she is playing the French bassoon in the Vienna Philharmonic. Actually, very few bassoonist play the French bassoon any more, even in France. Practically all have switched to the German bassoon, for a variety of reasons. Excellent point. She is a French musician performing (beautifully, based on the YouTube videos I just listened to) on the German fagott, not on the French basson. What is a French musician??? You mean a French citizen who is a musician? Because musicianship does not know nationalities. Well, she is more French than her bassoon is. After all, it was built in Germany (assuming it is a Heckel). Then again, the wood for the bassoon probably came from Yugoslavia — and yes, probably when Yugoslavia still existed as a political entity. You reply is a nice example, how shallow the idea of nationality actually is. When Heckel senior began to build his bassoons, there was no German nation state. When the tree grew, there was no Yugoslavia. Regional traditions, refined through artistic ambition, enhanced and elevated through global interchange and innovation, were what filled the history books with achievements in music and instrument making. Nationality played more the role of an obstacle and division than of a positive force in all this. So I have no idea, what the fact that she might hold a French passport have to do with anything musically? Of course there are many fine particular traditions within the geographical borders of France. But they are manifold and not easily and without gross simplification pressed into the arbitrary nation box. Her bassoon was built in Germany but not by Heckel. She plays a Püchner Modell Superior (also known as a “Püchner 6000”). Mrs. Dartigalongue had to leave the Berlin Philharmonic after her term of probation. Very obviously a case of sexual discrimination, isn’t it Mr. Osborne? Why don’t you mention that? It’s only discrimination if Asian females fail their probation period. I have no idea if she failed her BPO probation, but the BPO typically has a pretty high non-tenure rate – it was around 30% about a decade ago, if I’m not mistaken. I’m sure you know better than to confuse a single case of tenure/non-tenure with a broader trend, so suspect you’re being disingenuous just to be gratuitiously provocative. Here’s a story a friend told me on the phone the other day. He’s the retired assistant principal bassoonist of a major American orchestra. One day, he was playing principal in a PDQ Bach concert. Schickele was the soloist in the PDQ Bach Concerto for Bassoon vs. Orchestra. For most of the concerto, the soloist actually plays. However, there is a gag in which the principal bassoonist plays the solo line with the “soloist” faking it, then his faking is caught. Has Mr Werba stepped down to play 2nd bassoon on a permanent basis or are these concerts a one-off for him? (He is pictured on her left in the rehearsal shots). I wasn’t aware that she had failed her probation on contra at the Berlin Phil – is this really true? If so, all credit to her for achieving such a successful outcome. Others above question the stature of the VPO – seeming to infer that they are not quite in the league that they were in years gone by. IMHO they never disappoint on the few occasions I have been lucky enough to hear them live and I continue to regard them as truly world-class. Their Schmidt 2nd Symphony at this years Proms was absolutely stunning and quite rightly brought the house down. Very much looking forward to the broadcast of tomorrow’s concert. I don’t know whether Prof. Werba is stepping down to 2nd Bassoon or possibly retiring in the near future (he’s only in his 50s I believe but has been member for 36 years and is therefore eligible for full retirement), but in the announcement declaring Sophie Dartigalongue the winner of the principal bassoon audition, she was described as his successor in the Staatsopernorchester (and hopefully in the Wiener Philharmoniker). Michael Werba ia retiring, and he is seated next to Sophie as 2nd bassoon. Sophie is French, but she most definitely playing a German made instrument. It is unlikely EVER that we will see French made bassoons in this or any other German or Austrian orchestra. I am very sure that she is an excellent player and will do herself and the cause good. There is a potential issue with this, though. In the absence of a chief conductor to shape and develop the sound, the VPO did so itself, organically, as a body of men over many years, now happily men and women. But how can this be continue to be done at major events such as the New Year’s concert, with musicians only just appointed to either the state opera orchestra or VPO proper sitting at a principal’s desk? A political decision has been made, that the optics must needs outweigh the sound. Many musicians have played as principals in the New Year’s Concert in their first Season with the orchestra. People just take notice now because it’s a woman. would a newly appointed principal, male or female, playing any instrument in any other major orchestra (berlin, concertgebouw, new york, chicago, etc in no particular order) get this much attention for playing what is essentially a light pops concert? this is part of any newly hired musician’s probation, period. there are political undertones, sure… mostly for everyone else to talk about here! miss dartigalongue is a first rate player – welcome to the 21st century, please! A concert viewed by 50 million people in 90 countries that stood as a worldwide symbol of sexism. And with only 7 women in the concert, it still does. I think 50 Million people globally enjoyed the New Years concert from Vienna and its music. And a single man saw a “symbol of sexism”. Perception is in the mind of the perceiver. Sorry man, but I really had to laugh about your comment. I could see that Sophie Dartigalongue’s very elegant, French sensibility might not fit in the rhythmically aggressive, tense, highly corporeal, almost pounding style of the Berlin Phil. By contrast, her fluid grace and beautiful tone seem almost tailor-made for Vienna and the very human beauty of the orchestra’s Austrian “Gelassenheit,” grace, and rich sound. I think this will be a marriage made in heaven. Ms. Dartigalongue won 2nd prize in the 63rd ARD competition, which is probably the most competitive in the world. No first prize was given. The 2nd prize winner of the 62nd ARD competition was Rie Koyama. (Again no first prize was given.) Ms. Koyama was born, raised, and educated in Germany. Interestingly, her highly technical, rhythmic, very corporeal approach to performance would be fairly ideal for Berlin. You can listen to her at the link below. Be sure to hear the remarkable virtuosity starting at about 2:12. Can anyone tell me who the composer is of the modern work that is last on the video? I believe Ms. Koyama won the special prize for the performance of the competition’s commissioned work with this piece. William, your comments are as always, enlightening and interesting on this subject. Your enthusiasm and support of these up-and-coming new women players is wonderful! It’s my opinion that the dramatic changes we’re seeing at VPO are in large part due to your commitment and dogged reporting on their hiring practices. However, I am going to call you on the mention on Rie Koyama in this context. It’s tangential and it sounds like a tv ad on prime time. Perhaps there is truth what your critics say about your being a little too enthusiastic about the representation of Asian musicians in orchestras. Female Asian bassoonists are not a rarity. South Korea boasts leagues of them, most of a very high level. And yes, they are winning orch. positions Rie Koyama is a fine player, and she has a great job with Stuttgart Chamber Orchestra. She did a wonderful job with ARD and quite frankly I don’t think she needs your help. I understand that she attended the same conservatory in Germany where your wife teaches, and that you probably have a personal interest in her success, but this is not the time to promote her career. This is Sophie Dartigalongue’s moment. I’d also like to gently remind you that Asian players, particularly Koreans, are holding a near monopoly on major international competitions on every instrument right now. It’s becoming difficult for non-Asians to be considered. I’d also like to ask you to look at the ratio of Asians, esp. Asian women in every major US orch. These are among the highest paying orch. jobs in the world and Asians dominate every section. It’s newsworthy when a US born, caucasian or black or hispanic player wins an orchestra job. These are the players who need your support, Mr. Osborne, not Asian women, who are doing just fine. If Vienna is reluctant, the rest of the world welcomes them with open arms. Since you’re American, perhaps you’re aware of the furor at UC Berkeley and several other top US universities, including Harvard, when enrollment data recently began indicating hugely disproportionate numbers of Asian students being admitted at the expense of hispanic, black and caucasian students who were rejected. Here is UC Berkeley’s current enrollment data: http://opa.berkeley.edu/uc-berkeley-fall-enrollment-data Please notice the overwhelming Chinese admissions nos. at this top university. In the US , Asians are not an underrepresented minority in education, top paying professions or even in music, Mr. Osborne. In fact, their overwhelming presence, as noted by the UC Berkeley issue, is making it more difficult for other racial groups to be considered. are the only ones who can afford to to them anymore. The Asian thing is outdated, William. They are doing fine with or without Vienna. I’ve never advocated for more Asians in American orchestras, where they do not face discrimination, or for more Asian winners of competitions. The issue is the discrimination they face in German-speaking orchestras. As for mentioning Rie Koyama, I’m especially interested in the remarkable contrast in her style with Dartigalongue’s, that they are both ARD winners, and how they fit the styles of the two orchestra’s under discussion. You are the one reading her ethnicity into the issue, which I didn’t mention at all. The contemporary piece is called Νυξ – Nyx by Cypriot composer Evis Sammoutis. The moment you run into a crowd who discuss the implications of WATCHING a musician you know you ran into a bunch of morons. Regarding Berlin – we’re missing a fundamental point: the Berlin job was contrabassoon, which is not the same as bassoon, and altogether different from SOLO bassoon which is clearly Sophie’s career perogative. Contra is a completely different instrument. I, for one, after watching her success at major competitions as a solo bassoonist, was quite surprised when she accepted the Berlin contra position. Sophie is a Solo bassoonist, not a contrabassoonist. In any wind section, the secondary winds – picc, eb clar, english horn, bass clar, and contra are a whole different kettle of fish than the 1st chair. These are entirely different instruments. The people who play them are specialists in those particular instruments .It’s very rare in the pro orch. world for a player to specialize in both primary instrument and secondary. catastrophic. They don’t generally do it. Once in a while, the secondary instrument is written into a 1st player’s part – most often flute/picc. But of all the winds, 1st bassoon is the least likely to every have to play contra. They are 2 distinct specialtiies. So it’s not surprising at all that Sophie decided to move on from Berlin into a solo position. with Vienna. That is what she has been trained for. She is a Solo Bassoonist, not a contrabassoonist. As your screen-name suggests, you are well aware that there are always more vacancies in the strings than there are in the winds and wind-players also face greater scrutiny based on regional schools and styles (i.e. American vs German or French woodwind playing). The bottom line is that it’s always better to play contra (earning a very nice salary, like the Berlin Phil’s) for a few years while keeping an eye out for other positions one might prefer, than to turn down a contra or tutti position, ending up without a job and on a steady diet of processed cheese and Mother’s Pride. Hmm, James Galway’s first or second orchestra job was a piccolo job, Stanley Drucker played Eb clarinet with the New York Phil for 11 years before he took over as principal. 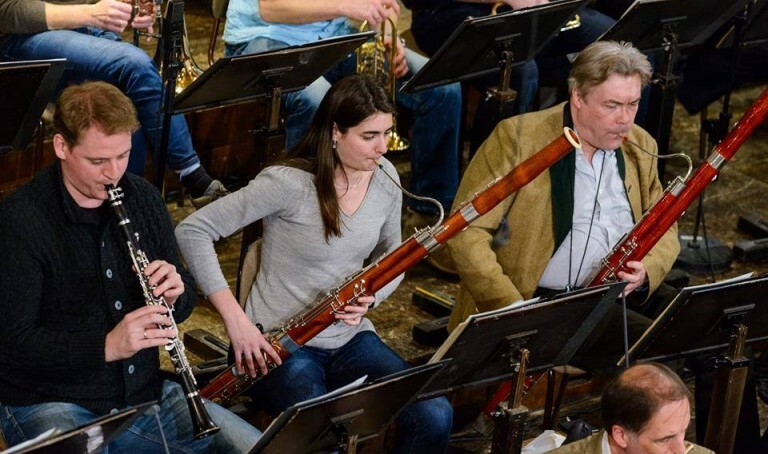 numerous prominent oboists have played concerti and chamber music on English Horn and Oboe d’Amore at a very high level, and I would imagine there was some precedent with Contrabassoon as well. Sophie had a chance to play with one of the world’s great orchestras for several years playing contra; I don’t see that as a questionable path. Yes, of course, but I’m sure you know that these are exceptions, not the norm. I’ll add 2 more to the list – rumor has it that Harold Wright won the Eb audition in National to improve his salary negotiations in Boston as Principal. He didn’t take the job, he just won the audition! Julius Baker’s recordings of the Vivaldi picc concerti are among the finest out there. Starting on contra or any secondary instrument, or excelling at one as a Principal player are not questionable paths at all! The point I was addressing, perhaps a little too discretely, is why Sophie did not remain in Berlin.That’s what people were buzzing about in these comments. Why did she not remain after her probationary period? Why? Because she is not a career contrabassoonist. She is a Principal player. Another point to consider is that Berlin is a “destination” orchestra. Those who pass probation don’t often leave. It’s not a “stepping stone” to anything. It’s not there to provide experience for young players to move up the ranks.Any member of Berlin would probably be insulted by that concept. That’s what the Berlin Phil Academy does. It would have been more conventional for them to have taken a solo contra player from another major orchestra. In the 2 cases you mention, James Galway’s picc job was with a lesser orchestra. Pretty much anything is lesser than Berlin Phil, his final orch. job. Stanley Drucker moved up within his own orch., which is much different than using the Berlin Phil as experience to get another job. Starting on a secondary instrument with a lesser orch. before winning a Principal job is understandable, but we are talking about the Berlin Philharmonic. Hope this explains what I was getting at! wiener phil is great, but today only 6 or 7 girls !!! I notice that Dianne Winsor placed a post on the Facebook page of the International Double Reed Society about Dartigalongue playing the New Years concert. It has had 1375 likes and 317 shares, so far.